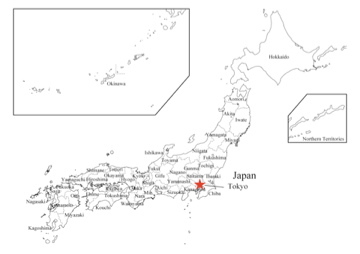 I hope you know,I live in a prefecture named ” Aomori” where is the northernmost part of mainland. 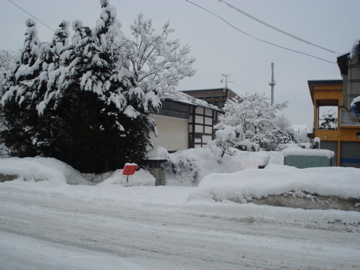 We have a lot of snow in winter. My grandpa always rakes away snow. 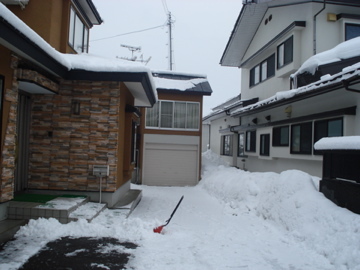 This is my neighboring house. I told you!! my home town is countryside. 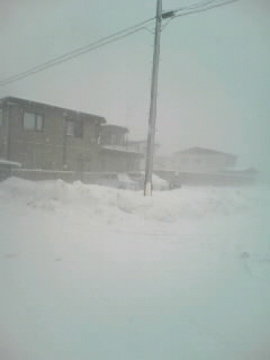 One day, When I came back from work,there was a blizzard!! It was hard to breathe…well,I couldn’t breathe and see what’s going on!! but it’s usual here,I could go back to home. I’ve survived in this town! 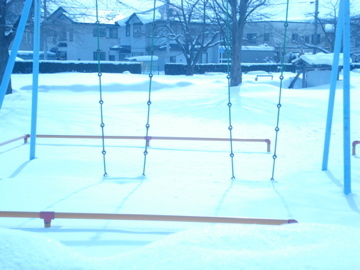 !so I’m sure I could survive in Toronto even in Feb.
Well, if you want to visit my town,you’re welcome!! It looks nothing, but you can eat really good scallop,tuna,and apple!! but if you can’t speak Japanese,it’s difficult to have conversation with people. Even if you can understand “normal Japanese”,you can’t understand what they are saying. For Yohei,also it’s difficult to understand. and they went to a noodles restaurant. So if you want to talk to people in my town, you have to learn another language like learning English. But don’t worry!! I’m here for you!! Whenever you want, PLEASE COME!!!!!!!!!!!!!! Posted in city. Bookmark the permalink. uhhhhhh,,,, do you live appropriate place to live or to call people as Japanese ??? hahah Im kidding ! IT IS IMPOSSIBLE TO HEAR JAPANESE LIKE FRENCH !! If it is ture, nobody cant understand THE japanese !! that sounds so funny to me… i’m not even sure that yohei can understand usual japanese.. i remember when he was looking for words in this japanese restaurant in toronto and couldn’t speak properly. you had to order for us… 🙂 so you speak alot of languages, though.. how is your spanish goin? hahaha…Yohei is not Japanese anymore!! Um…I’m going to study again…well,I have to!! I think you should study ANOTHER JAPANESE too! !